Yesterday, lying on the bed, I was ready to tell the story (but am only able to upload it today). As I said, we went to Cambodia yesterday. We were supposed to be picked up at 6.40 am this morning and as our hut was a minute away from the road and Thais are not known for their punctuality, we weren’t yet ready,when a bus driver knocked on our door at 6.30 am. But he grinned at us and told us, he’d be back in 10 minutes. When he wasn’t, we walked up to the street and waited there. At 7.30 am – another bus driver had stopped twice before he realised we weren’t his passengers and I had started to think the bus driver had just fooled us and would never come back – he finally arrived. In the end it was the bus driver, an Englishwoman and us in an old minibus going first on the ferry to the mainland and than 3,5 hours to the border. 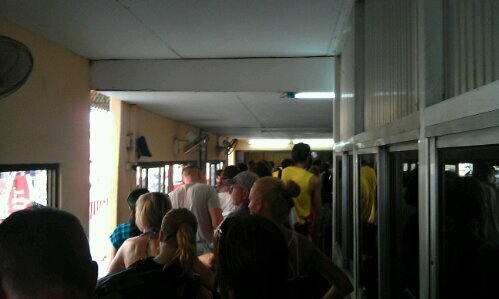 We were dropped of at a restaurant close to the border at 1.30 pm. Minibus after minibus arrived, people got sorted out newly, marked with a coloured sticker and send to the border (you can only cross the border walking). Walking towards the Thai emigration officer, reading the signs, we realised, that after leaving Thailand our visa that was supposed to be valid for 60 days would be gone and coming back by bus they would only grant us a 15 days Visa but our flight wouldn’t be until more than 20 days later. I walked through emigration thinking, all would turn out eventually, but Michael talked to the officer and he figured out we would need a re-entry visa and called me back. Paying for it was no problem. 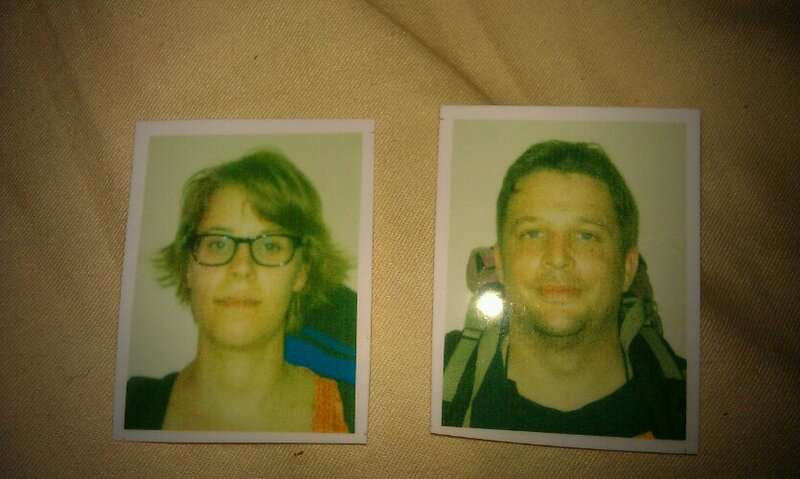 What took its time was getting new passport size pictures as we had used our two spare ones already for gaining the Cambodian visa. So we were send to some officially looking office around some corners at the border to take new pictures. And yes, quality seems to be no issue when applying for a Thai visa. But finally we made it through, walked past all those big casinos, Thai people cross the border for, and got sorted into new groups again, send to a bus station and finally borded the bus to Siem Reap at 4.30 pm where we arrived around 8 pm. Summing up: a bit more thinking, not believing everything someone tells you and a little different planning visa-vise could have saved us money and time, but I guess now we are all fine and shouldn’t have no problems when re-entering and later leaving Thailand. So remember: if you enter Thailand and plan to stay longer than 30 days (that’s what you get as visa on arrival, with a European Union passport at least) AND plan to go to Cambodia and/or Laos, try to make sure you use up your 30 days in Thailand first before leaving the country. Coming back by bus gains you another 15 days visa while coming back by plane will result in 30 days visa again (whysoever). This means you don’t have to go to your closest consulate office to apply for an 60 days visa as we did. 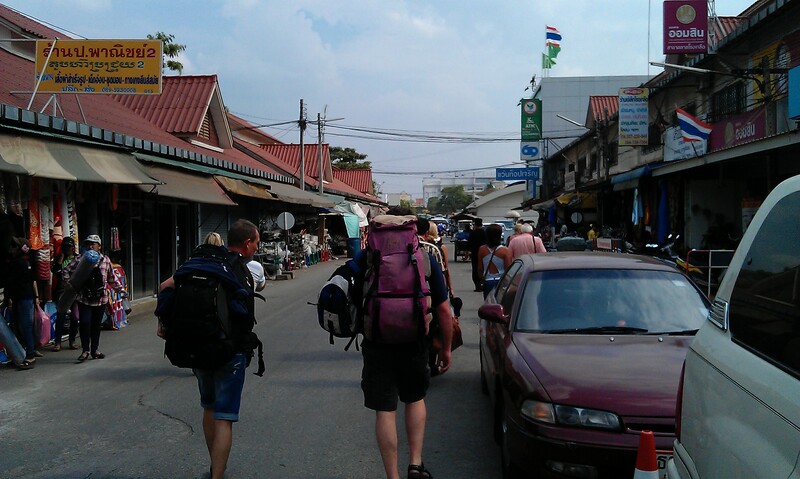 This entry was posted in Cambodia, Thailand and tagged Border, Travelling by kathatravelling. Bookmark the permalink.